Cramer & Anderson Attorney Abigail Miranda has been named to the Board of Directors of The Women’s Center of Greater Danbury. “I am honored to join the Board of this established and important organization in our community,” said Attorney Miranda, an Associate with the law firm based in New Milford. Founded in 1975, the Women’s Center has provided a safe haven as the sole provider of services to victims of domestic and sexual violence in the Northern Fairfield and Southern Litchfield County areas, according to its website. The Center’s primary focus areas include emergency shelter and support services, counseling and advocacy, crisis intervention, and community education, along with prevention and training. Each year, the Center serves more 20,000 individuals from its 13-town service area: Bethel, Bridgewater, Brookfield, Danbury, Kent, New Fairfield, New Milford, Newtown, Redding, Ridgefield, Roxbury, Sherman, and Washington. The Center’s free and confidential services are available 24 hours a day, 7 days a week, 365 days a year. “I admire the Women’s Center’s longstanding presence and initiative in the community and look forward to committing to their mission to end domestic violence against women, men, and children and foster equality and empowerment for all,” said Attorney Miranda. The first Board meeting for Attorney Miranda is scheduled for Jan. 25 at the Women’s Center, located at 2 West Street in Danbury. A member of the Connecticut Coalition Against Domestic Violence (CCADV) and Connecticu t Sexual Assault Crisis Services (CONNSACS), the Women’s Center may be reached at (203) 731-5200.
, Divorce & Family Law, Municipal Law, and Personal Injury Law. Among the distinguished women Attorney Miranda joins on the Board of the Women’s Center is fellow New Milford professional Karen Ross, owner of Joe’s Salon & Spa on Bank Street. Offering a full range of sophisticated legal services, close to home, Cramer & Anderson also has offices in Danbury, Litchfield, Kent and Washington Depot. The firm’s service area includes all of the communities served by the Women’s Center. 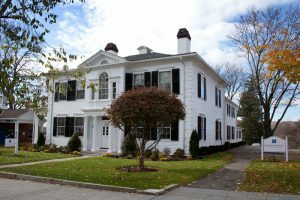 To learn more about the firm, see the website at crameranderson.com or call the New Milford office at (860) 355-2631.